I participated in a twitter dialogue with @datachick (Karen Lopez) last week on the #WIT (women in technology or women in information technology ?) hash tag. I don't think there'd be much argument that women are under-represented in IT, and that a more balanced split would benefit the whole industry. My question was what can us blokes do to encourage more women into the industry (or to stay in the industry). There were a couple of helpful suggestions. Karen's first point was to encourage girls into STEM courses (Science, Technology, Engineering and Maths). No problem there. We could also do with a few more teachers specializing in those areas, but that's a separate topic. Another point was that women may not push their opinion into a discussion, and it could be helpful to actually ask for their input. Or ask for their help if you are stuck. They know stuff. I follow several women tweeters/bloggers, including DBAKevlar, datachick, Erin Stellato, Lisa Dobson, Gwen Shapira, Mary McNeely, Boneist.... Not because they are women, but because they contribute interesting content. Karen then recommended challenging any ant-diversity practices and @zippy1981 raised the matter of introversion. There are a lot of introverts in IT. Sitting in a corner, coding away. I suspect there will be fewer in years to come, at least in development. The increasing pace of change, and a closer dependence of the business on IT, means less scope for solitary activity. Again, another topic. But in the meantime, introverts are not going to be the ones giving talks at schools on career day. Or challenging the alpha-males in the executive positions who might skimp on diversity-friendly practices. True Story: One place I worked had the ladies toilet larger on each floor than the gents (because cubicles take up more room than urinals), except on one floor. The large skew in the IT section meant that the gents got extra space. This sometimes confused women visiting the floor....but never more than once. There's a lot of gray area between recognising an existing imbalance, reinforcing it and falling back to the "it's an industry norm" excuse. I don't have any solutions. It is just something to think about. 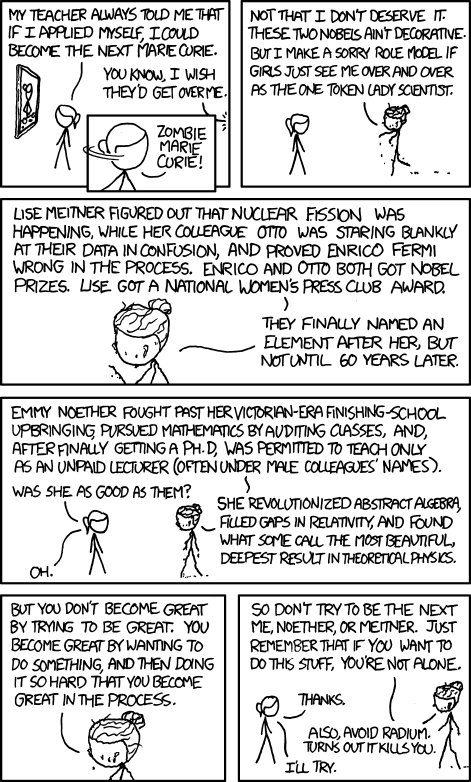 Oh, and the recent XKCD is sort of appropriate. datachick: Best? Talk to young people about your career and the opportunities it provides. Encourange them to tak STEM courses. datachick: People can help by challenging immediately anyone who contributes to anti-diversity practices. datachick: I want to solve the problem of girls tinking that IT is a solitary job. None of my work has been. datachick: Or that the only IT job is programming. I still fight that one, though, with adults. datachick: Generally young girls are attracted to more collaborative jobs, which is why I want them to know IT has those. zippy1981:I'm all for them taking those jobs so I can sit in the corner. Give me a fast Computer and a bug report to steer her by. zippy1981:I'm saying that MIT that would appreciate more #WIT would encourage them to follow the same path that got them there. zippy1981:I guess what I'm saying is I'm going to encourage a person who wants to be in my field to follow what worked for me. I don't know what the big deal is about having more women in IT. I just don't get why it is even being discussed. I don't think that women are not being given the opportunities. I have worked for 3 companies where the CIO was a woman. To me, we should accept it as a fact of life and move on! There's a bunch of reasons (at least as far as I'm concerned). One main one is I want to see an end to the 'We want super-geeky loners with no social life and a caffeine addiction to work long hours' attitude. If you want to work evenings programming, great. Find a suitable personal project or contribute to open source. I've been consulting at a government site. Their IT department has a higher proportion of women than our consultancy, and one reason is that the consultancy pushes for those longer hours. A lot of it simply comes down to making the jobs more widely appealing. Increasing women in IT will not change the attitude of the super-geeky loners with no social life and a caffeine addition. If your employer pushes you to work longer hours, you can always say no as well as women do. It is a matter of finding a balance yourself. Other people will not change your own attitude or your manager's attitude. As a result of having more women saying no to long hours, guys working in that department may be working even longer hours to make up for the hours that women don't want to work. I used to work long hours and I got burnt out. So I did something about it. I found myself another job in which I have a life-work balance. I did not need anyone(man or woman) to make me change my situation. You are the owner of your own life, don't ever forget. I've got to the stage where I will push back on too many hours. My point was more that a workplace that has women is probably a better place to work, is a workplace that doesn't expect massive overtime to achieve stupid deadlines or otherwise abuse its employees. Consider them a litmus test for working conditions. An organisation that doesn't employ women in IT (intentionally or accidentally) is probably run by idiots. If you have a choice between changing their attitude, walking away or putting up with it, then the first benefits more people. I think I've done too much of the latter options. My experience working with more women than men was atrocious, Gary. I've worked with a couple of 'men only' teams and some more mixed. Never one that has been mostly women though. Gary, thanks for the mention!